Next up is the eight-minute Elegy for solo cello, and a String Quartet in two connected movements. It requires just 12 minutes. These are similarly intense works, although the String Quartet is lightened a little by the inclusion of what sounds like folk-inspired material. These too are very well performed. The closeness of the microphoning emphasizes the grit in cellist Renato Ripo's tone, but the effect is more expressive than frankly unpleasant. 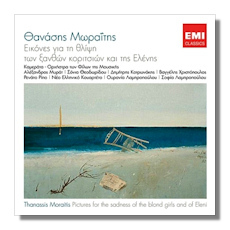 The second CD opens with the Amsterdam Concerto for guitar and orchestra, so called because Moraitis composed the bulk of it in that city in 2000, while on tour as a performer. This is an honest-to-goodness classical concerto for guitar and strings, composed in a modern style, but sufficiently tonal and tuneful to keep even skeptical listeners engaged. The slashing rhythms of the third movement, which alternate with restlessly wandering melodies from both the strings and the soloist, are particularly attractive. I'd say this concerto is ready for export. The same holds true for Kotronakis's playing; as I noted in an earlier review of Clear Note 160999, Kotronakis is deserving of international attention as well, with his rock-solid technique and musicality. Here, though, the string orchestra sounds a little shrill and dry; I can't tell if this is a function of the engineering, or part of their actual sound. The last two works incorporate folk instruments to good effect. The mysterious and atmospheric Stories of grandma sea retains its interest over the course of 22 subtly variegated minutes, which build to a fine and moving climax, thanks in large part to the interesting timbral interactions between the santouri (a Greek version of the hammered dulcimer) and the harpsichord. Unfortunately, I don't know for sure who or what Fajum is, but I think the title might allude to the Egyptian city of Faiyum noted for its waterwheels and mummies. The instrumentation suggests that this might be the case. The quanun is related to the zither, the ney is a kind of flute, and the "lira of Istanbul" (or "lyra") is not currency, I think, but a small bowed instrument with a plaintive timbre. The soulful Fajum allows these three instruments to shine individually and to interact with one another, supported by cello and double bass. The music's gentle and sensuous insinuations suggest the soundtrack to a film not yet made by director Atom Egoyan! This collection might be difficult to find, but according to Kotronakis's website, you can download it via iTunes. I believe it would be well worth your effort to do so!